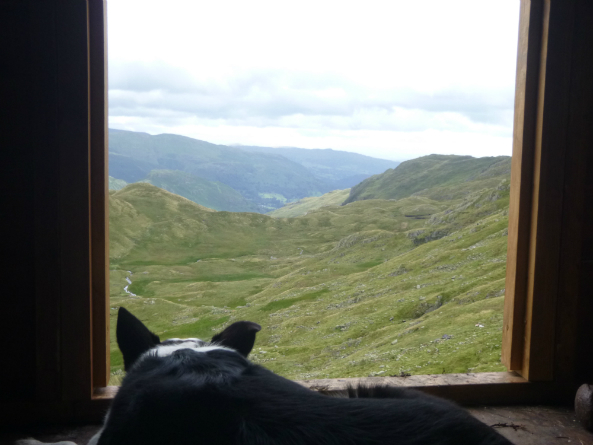 With the autumnal colours starting to show and the days growing shorter, our season on the fells is nearly at a close. Normally the weather at this time of year allows us the chance to really knuckle down before we head to the valleys for the winter, this year however, has provided us with some ‘spicy’ weather! 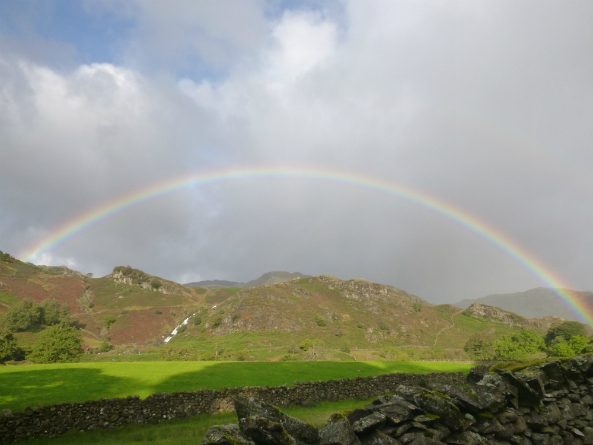 Between the weather warnings for wind and some heavy showers we have continued our work and although we have not been basking in the sun, we have been treated to some wonderful rainbows. We are currently working on our project on Greenup Edge. We walk in from Brimmer Head farm, which gives us roughly a three mile walk up on to site, where thankfully we have a shed. Not only to escape the weather, but also to store work waterproofs and luxury items such as a stove to brew up with or cook some bacon butties! 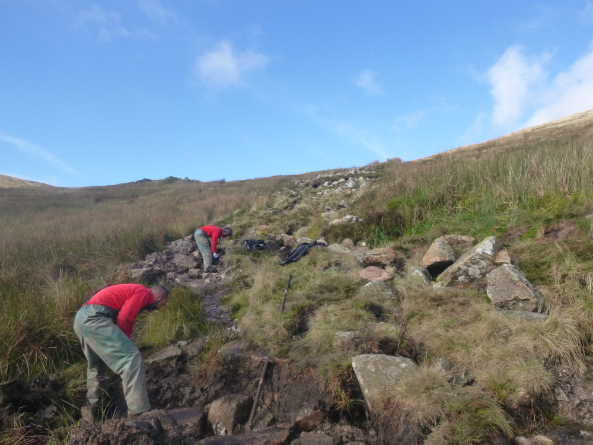 Our main task for Greenup Edge is to work on a section of Coast to Coast that was damaged during storm Desmond. We are largely planning to pitch the steepest sections that are most susceptible to erosion, alongside using landscaping techniques to ensure walkers stay on the path. With it being a popular path, we are getting plenty of opportunity to see where walkers want to be. We are also getting to see where they are coming over onto the path from Borrowdale. Greenup Edge is a notoriously boggy spot and in bad weather the route across from Lining Crag to Greenup can be difficult to navigate. Hopefully with the work that we are doing we will not only create a much more sustainable path line, but a line that will also give a bit more confidence to walkers that they are where the think they are and not just in the middle of nowhere! Luke and Ben pitching their way up the fell, a fairly messy place in spots. Work is progressing well, and the impact we have made is already becoming visible, especially if you knew what it was like before. The below picture gives a small insight into the progress that’s been made. If you can’t quite make out the path, you can at least see that the piles of stone are slowly but surely dwindling as rock is put in the ground. The people working have progressed up the fell too! This next set of pictures give more of a close up view of the path. There will be plenty of landscaping for us to do on this section, but to give it the optimum chance of success we will wait til early next season when the grass will get the best chance to grow and bind the soil together. This also allows us the chance to really focus on the stone work, and hopefully use any material that comes out of the landscaping in a more effecient way. There’s certainly plenty to keep us busy into next year! We’ll be up here until the end of October and then we’ll drop back down into the valleys to work alongside our lowland colleagues. Our job list this year is quite varied and will give us a bit of a break from working with stone, as we have numerous tree cages and fences to build. I’m sure that while we’ll be grateful for not having quite so far to walk into our worksites over the winter, we’ll also miss being up on the fells. Especially when this is the view from the ‘office’! If you want to keep up with our work day to day then follow us on twitter!